So . . . just what was it that happened with the Vancouver Giants and Troy Ward, the 25-game head coach who lost his job on Wednesday? Steve Ewen of the Vancouver Province takes a look right here. The QMJHL’s Quebec Remparts have been sold and Ken Campbell of The Hockey News reports that one source has told him the sale price was “north of $20 million, and could perhaps be as high as $25 million. ” . . . Campbell’s piece is right here. 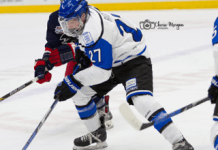 G Logan Thompson, who was dropped from the Brandon Wheat Kings’ roster on Tuesday, will play for the AJHL’s Grande Prairie Storm. Thompson, 17, was a sixth-round pick in the 2012 bantam draft. . . . He was released by Brandon after it acquired G Alex Moodie, 19, from the Saskatoon Blades to play alongside Jordan Papirny, 18. . . . Thompson will remain on Brandon’s protected list. . . .
F Taden Rattie, 16, of the AJHL’s Whitecourt Wolverines, has committed to the Western Michigan Broncos of head coach Andy Murray. In 27 games this season, Rattie has nine points, including five goals. . . . 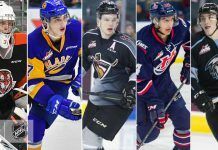 He is the younger brother of former Portland Winterhawks star F Ty Rattie. . . . Taden was never selected in the WHL bantam draft.